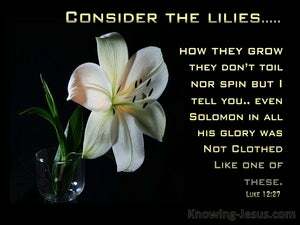 ﻿ Luke 12:27 Consider the lilies how they grow: they toil not, they spin not; and yet I say unto you that Solomon in all his glory was not arrayed like one of these. 26 If ye then are not able to do that thing which is least, why take ye thought for the rest? 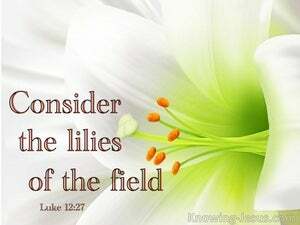 27 Consider the lilies how they grow: they toil not, they spin not; and yet I say unto you that Solomon in all his glory was not arrayed like one of these. 28 If then God so clothes the grass, which is today in the field and tomorrow is cast into the oven, how much more will he clothe you, O ye of little faith? And when the queen of Sheba heard of the fame of Solomon concerning the name of the LORD, she came to prove him with enigmas. And when the queen of Sheba heard of the fame of Solomon, she came to prove Solomon with enigmas at Jerusalem, with a very great host and camels that bore spices and gold in abundance and precious stones. And when she was come to Solomon, she spoke with him of all that was in her heart. 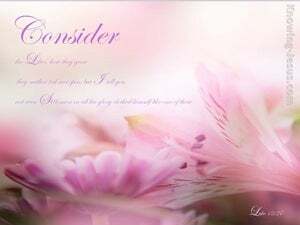 Consider the ravens, for they neither sow nor reap, which neither have storehouse nor barn; and God feeds them: how much more are ye better than the fowls? 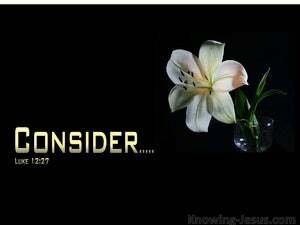 and he who is rich, in his low status, because as the flower of the grass he shall pass away.